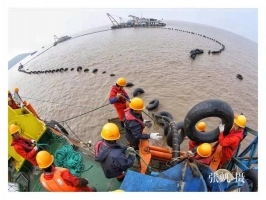 In November 2018 the 500kV XLPE insulated optical fiber composite submarine cable of 18.15km and without joints manufactured by HENGTONG has been successfully and completely laid in Dapeng Island, Zhoushan City, Zhejiang Province. This also marks that the Zhejiang Zhoushan 500kV Transmission and Transformation Project has entered a critical stage. The laying was from Xinhongkou of Zhenhai to Dapeng Island, Jintang and took 7 days to be completed. The submarine cable of 18.15 km is with the highest voltage level, the biggest transmission capacity among XLPE insulated optical fiber composite submarine cable in the world. HENGTONG created a new record with sweat and wisdom. To manufacture a long joitless submarine cable of high voltage level and big capacity, HENGTONG must have exacting standards in management, technologies and equipment. HENGTOG has carried out a number of technical renovations and technological innovations on the equipment, and examined all the 348 process control points, especially in long-term insulation extrusion. During the manufacturing period, HENGTONG organized a team of 50 persons to participate in 24-hour duty in three groups to continuously monitor the production process and operation of the machine. Finally, after a 23-day continuous extrusion, the cable of 18.15 km was manufactured, creating the world record of the longest length of the 500 kV XLPE submarine cable without joints in the world. Zhejiang Zhoushan 500kV Transmission and Transformation project was approved by the Zhejiang Development and Reform Commission in May 2016, with an investment of 4.62 billion Yuan, which is a cross sea interconnection project with the biggest investment and the most difficult in construction. The project creates two world records, namely, the tallest transmission tower of 380 meters and the first 500kV XLPE cable manufactured by a Chinese company HENGTONG. After the completion of the project, it will help to improve the economic development of the Yangtze River Delta region, guarantee the energy supply for a large number of key projects and Zhoushan Port; provide clean energy to the people and companies in Zhoushan New Area and Free Trade Port Area.